Sonam Kapoor, last night attended Fashion Trust Arabia 2019 award's ceremony in Doha, Qatar. Like she most of the times does, Sonam wore a quirky look, which by far was one of the most quirkiest one. This time courtesy, Anamika Khanna and Sonam's aunt, Sunita Kapoor. 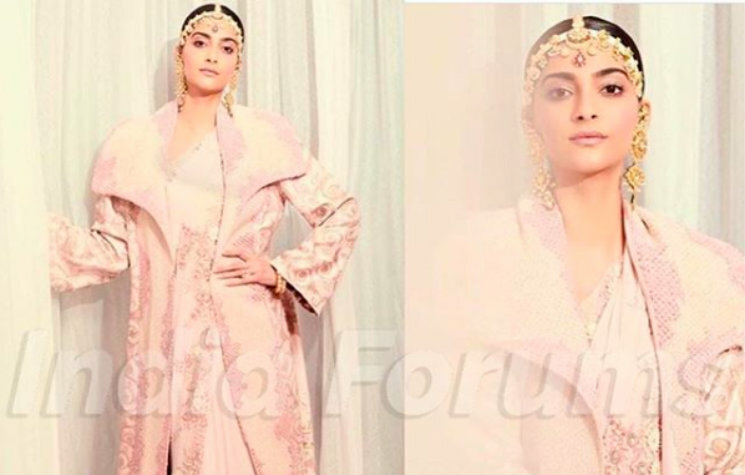 Sonam rocked a millennial pink colour embroidered drape by Anamika Khanna. What added the quirk was the same fabric coat. This monotone ensemble looked great on Sonam. She accessorized her outfit with a pearl studded maatha-patti and earrings to go with it, both from her aunt, Sunita Kapoor's exquisite jewellery collection. Sonam who has long been fan of Anamika Khanna's creative drapes, dhotis and design, did complete justice to this one- a coordinated fusion saree combo with the her kickass glam game. Using the help of her makeup artist, Sonam chose to keep her makeup matching to the colour of her saree. And to keep the maang-teek and the maatha Patti in place, Sonam opted for a centre-parted sleek look. Most recently, Sonam made a bang on our style desk donning a white trench gown, which brought back the memories of Priyanka Chopra's Ralph Lauren khaki trench gown. This white outfit that Sonam wore to Chopard perfume launch, also featured a long trail. Take a look at this piece from Danielle Frankel Studio. Sonam's sister stylist, Rhea Kapoor, always keeps us on our toes with her style picks, doesn't she? Let us know your thoughts in the comments below..
Kiara Advani REVEALS the truth about her link-up rumors with Sidharth! Is Sara UPSET with the reports of her AFFAIR with Sushant?